Rose Street is packed full with pubs and restaurants, it is always the first place to head for a meal (or a glass of wine) after a long day of shopping in town. One bar that always caught my attention is Element and last week they kindly invited me to come try out their menu. I brought my friend Rhiannon along (because sisters before misters... not that I have a mister) as she needed a well deserved break from her dissertation – plus I knew she'd let me try out whatever she ordered as well. The bar is at the front when you walk in and the restaurant area is separate in the back. The first thing I noticed when I got inside was the décor. The restaurant section has a super cosy feel with big leather couches around fireplaces, and oversized armchairs gathered around small tables – this where we were seated. The armchair was so comfortable that my friend and I had trouble getting out of them when we were leaving! The room reminded me of a really cosy lounge in a nice hotel in the Alps, where you'd chill with a hot chocolate after a morning of skiing – yes that's a pretty specific comparison. It had a really warm, inviting atmosphere, ideal for escaping the infamous Scottish weather. For my starter I chose the 'Home Cured Duck Pastrami' and oh my it was SO GOOD. Duck is one of my favourite meats, it has such a distinct and unique flavour and I find it a real shame that it often gets masked in heavy sauces (plum, orange, etc), but this dish was like a homage to duck. Thin strips of duck layered on a really unique salad of pickled stawberries, hazelnuts and endive with balsamic dressing. The sweetness of the pickled strawberries really brought out the flavour of the duck. My friend ordered the 'Tempura King Prawn' and kindly let me try one out. Deep-fried, battered prawns aren't anything new but the tempura batter on these was pretty spot on. I am pretty into seafood so for my main I ordered the 'North Sea Baked Cod' which came accompanied with scallops, mussels and herb gnocchi in a bouillabaisse sauce. The cod was really delicate with a nice crispy skin, and the scallops and mussels were cooked perfectly. The gnocchi was insanely good and bursting with flavour – although the pieces were absolutely huge (let's be real it didn't stop me attempting to finish it all). My gal Rhi ordered the 'Mushroom Risotto' which is a classic dish and nothing groundbreaking at first glance but this one was so good, I'm definitely heading back to order it myself. If you are a fan of mushrooms and truffles as I am this risotto is the one! I really wanted to try out the desserts but by this point I was so stuffed my skirt was beginning to cut off circulation, but the waiter convinced us to share one and I'm so glad he did. 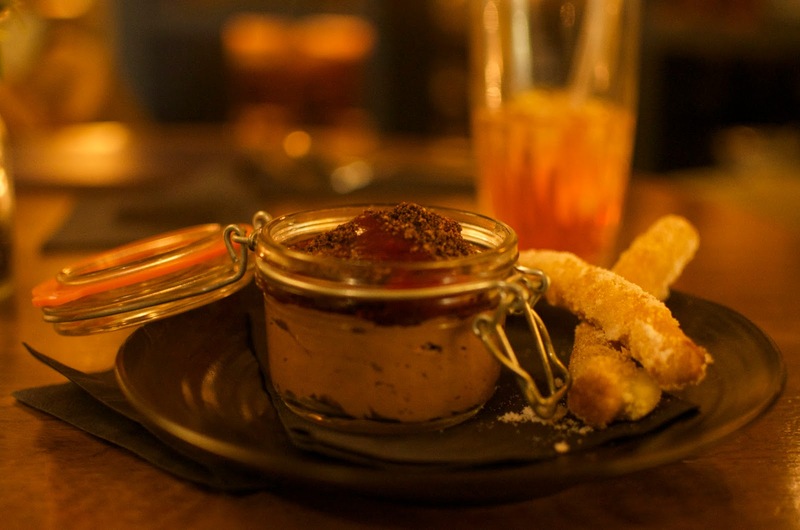 He recommended the 'Chocolate mousse' which came with raspberry coulis and a side of churros. That's right, churros. Essentially two desserts in one. The churros were more on the doughy side rather than crunchy, super deep-fried, which I personally prefer. This was the ultimate indulgent pudding and it was definitely worth risking bursting out of my skirt for. Element's menu maybe a little small with just a few dishes to choose from, but from what I've tasted it is definitely a case of quality over quantity. It is far better to perfect a menu rather than overcrowd it with dishes that aren't special. My eyes kept wandering over to the brunch and lunch menu which I also need to come back and try because we all know how much I love brunch. They also have a really great drinks menu the highlight of which is a list of their favourite gins each with their own recommended tonic and garnish. They even have a menu for nibbles including a cheese platter. 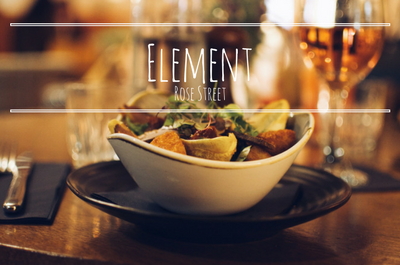 Element would be an ideal stop for a few drinks, cosied up in an armchair with a bite to eat on a cold winter's night. Overall I was super impressed with my meal and definitely plan on coming back. It would make a choice a date night or a 'parents come to visit so you convince them to buy you a nice meal' place. I also have to add that the service was really great, the guy serving us was super friendly and attentive – and recommended a top notch dessert, what more could you want? Disclaimer: I was kindly invited to review Element but this post, as with all my posts, reflects my own views and opinion.